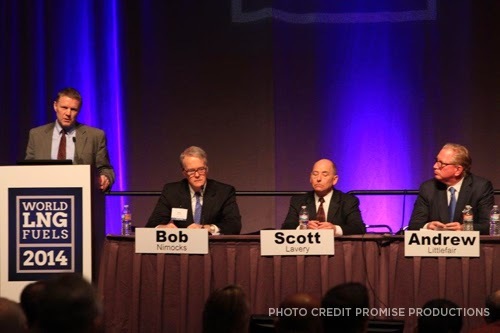 Gordon Exel, President of Cummins Westport, spoke to a crowd of around 500 at World LNG Fuels 2014 on January 22 in Houston, Texas on the panel Leading Projects, Trends in LNG-Fueled Highway Trucking. Other panel presenters Andrew Littlefair, President and CEO, Clean Energy Fuels Corp., Scott Lavery, Vice President, UPS and Bob Nimocks, chairman of the World LNG Fuels 2014 program committee rounded out the panel who agreed that liquefied natural gas (LNG), though not a prevalent as compressed natural gas (CNG) today, will be the choice of the future for over the road trucking. Gordon Exel, President of Cummins Westport, was part of the Leading Projects, Trends in LNG-Fueled Highway Trucking panel at World LNG Fuels 2014. He was joined by Andrew Littlefair, President and CEO, Clean Energy Fuels Corp., Scott Lavery, Vice President, UPS and Bob Nimocks, chairman of the World LNG Fuels 2014 program committee. Gordon’s presentation included an overview of Cummins Westport’s engines, the 8.9 L ISL G, 11.9 L ISX12 G and ISB6.7 G, which enable the use of both CNG and LNG. The 2013 launch of the Westport iCE PACK™ LNG Tank System, optimized for spark ignited engines, which enables fleets to fill up with cold LNG, was also highlighted in his talk. Audience members were curious about facility maintenance, natural gas vehicle payback time, and the associated challenges for fleets such as UPS which introduce large numbers of trucks into an area at once. The progress made in natural gas engines since the launch of Westport 15L engine with Westport first generation HPDI technology, according to Andrew Littlefair, has been remarkable both in terms of cost reduction and general market awareness. Gordon said Cummins Westport expects to see a robust demand for the Cummins Westport ISX12 G in 2014.